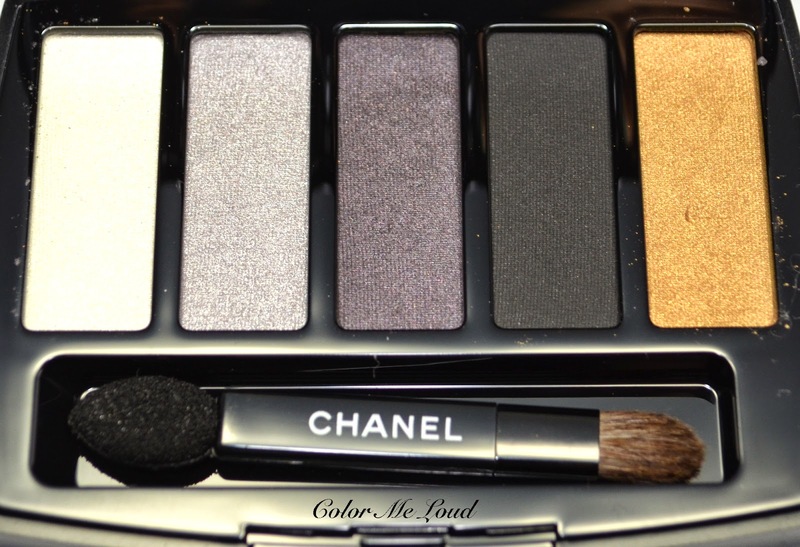 As my deadline approaches, the excitement and stress on this side of the screen gets rocket high but I can't keep myself from showing you Chanel's holiday eye shadow palette. I will try to keep it short as the photos speak for themselves. This is going to be the first review of the items I picked up from the collection. Les 5 Ombres doesn't have the signature Chanel pattern pressed on it. 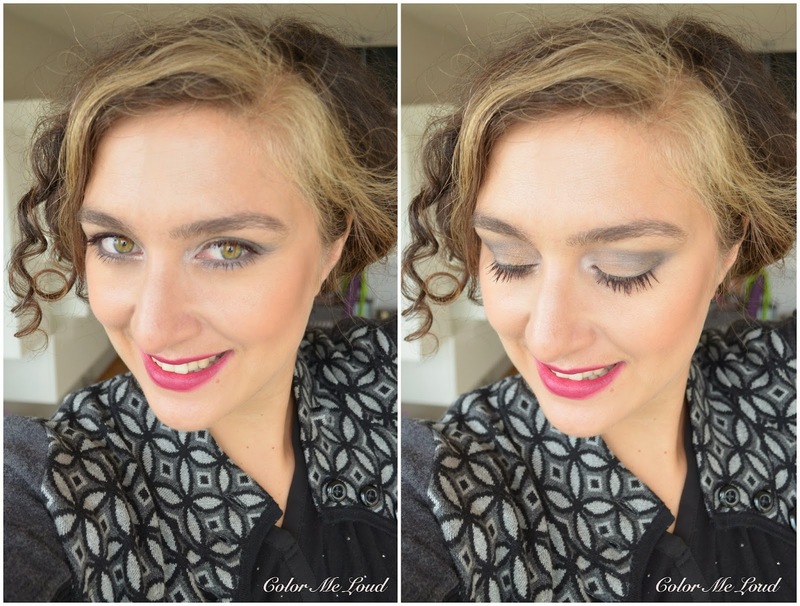 Les 5 Ombres lists two different formulas at the back, namely "cream powder" and "powder". It is hard to figure out though which pan has which formula. Golden eye shadow is significantly sheerer than the others so this one might be the "powder" one. Similar to their new gloss release, Chanel again cuts back from the weight as the price stays the same, last year's palette was 9 g/0.32 OZ while this one is only 7.5g/0.26 OZ. That said I find 5 Ombres more pigmented than last year's Charming. Left most: Very light cool white with satin finish. It is great for highlighting the inner corner or the brow bone but be careful with this one, it is very pigmented. 2nd from left: A light silver with a tad of lavender. This has a subtle metallic finish which is not overly shimmery. I really like the undertones of this particular shade, easier to wear than many other silvers on me. Middle: Deep blackened cool purple with matte finish. It is a complex shade but not because of its finish but because of its undertones. I really like it, it is a great alternative to black to define the eyes. 2nd from right: Very deep matte black. Although I like the quality and how deep it is, I don't think it was necessary in this palette. The deep purple was a nice blackened shade and a full pan black is something I wouldn't be using much. Sheered out the deep purple and this shade almost look the same. Right most: A very sheer mid-toned gold with satin finish. Another shade which I am not that fond of. I thought since it is sheer, I could use it to layer on the others, which I did on the eye make-up below. It worked but I needed to apply multiple layers for it to show up. If you find the rest of the palette to be too cool, this shade may make it work for you. I have tried to wear the palette two times. Each time I though the end result was nice but not ground shaking. Below I applied the white on the inner corner, silver all over the lid, purple on the crease which I attempted to deepen more with black but these two shades are almost dupes, so no luck in trying to make them show individually. I then layered the gold on the first half of the lid, which made the whole look a little warmer. Looking at the photos of the compact once more, I wished the middle shade would swatch a little lighter, like in this photo, compared to black. I would also love to have a true-to-pan pay-off with the gold shade. 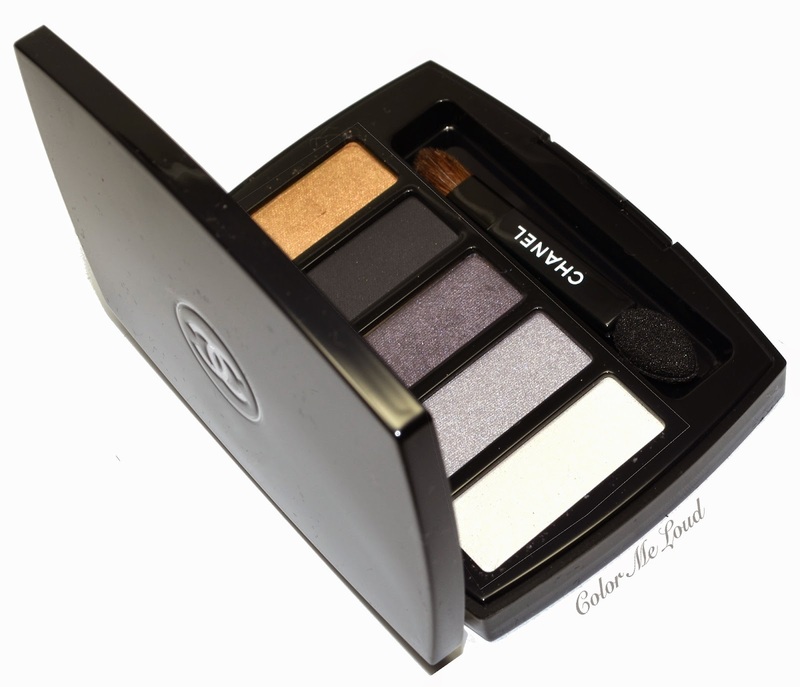 Final thoughts: Chanel Les 5 Ombres Oiseaux de Nuit Eye Shadow Palette is nice but it didn't blow off my mind. 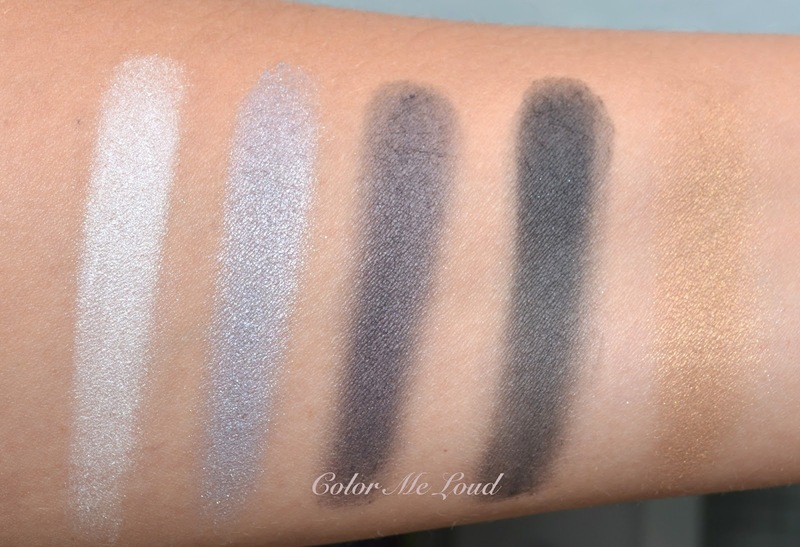 If you are in search for a cool smoky palette with good color pay off (I am ignoring the gold shade here) then you may want to check it out. Personally if I would have swatched it in person, probably I would end up not purchasing it. Price/Availability: Chanel Plumes Précieuses Holiday 2014 Collection is now available in the States. I believe in Europe we have to wait for one more month for the release. 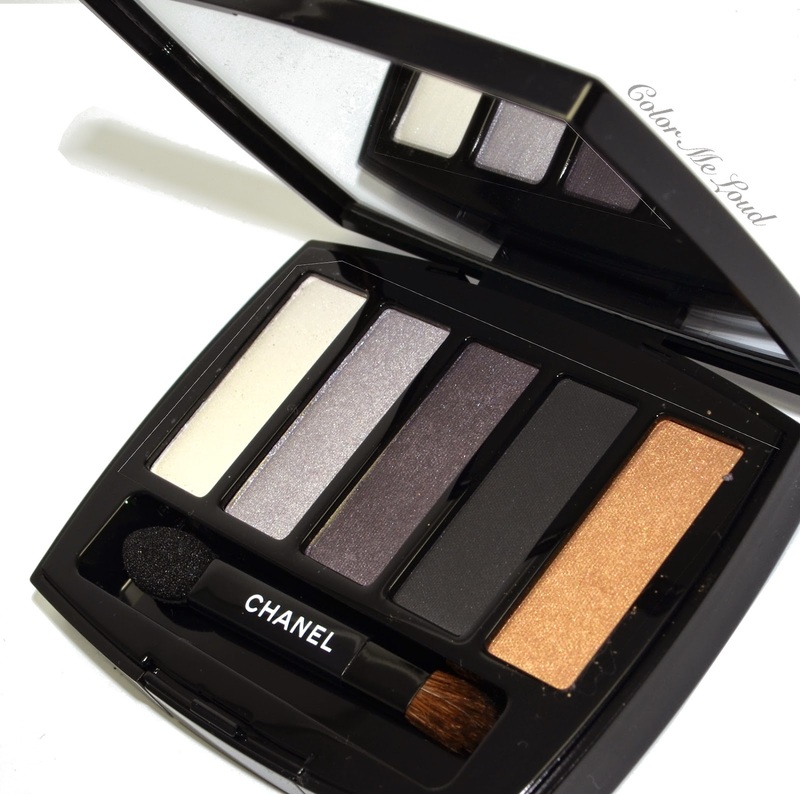 Chanel Les 5 Ombres Oiseaux de Nuit Eye Shadow Palette costs $70 in the States. 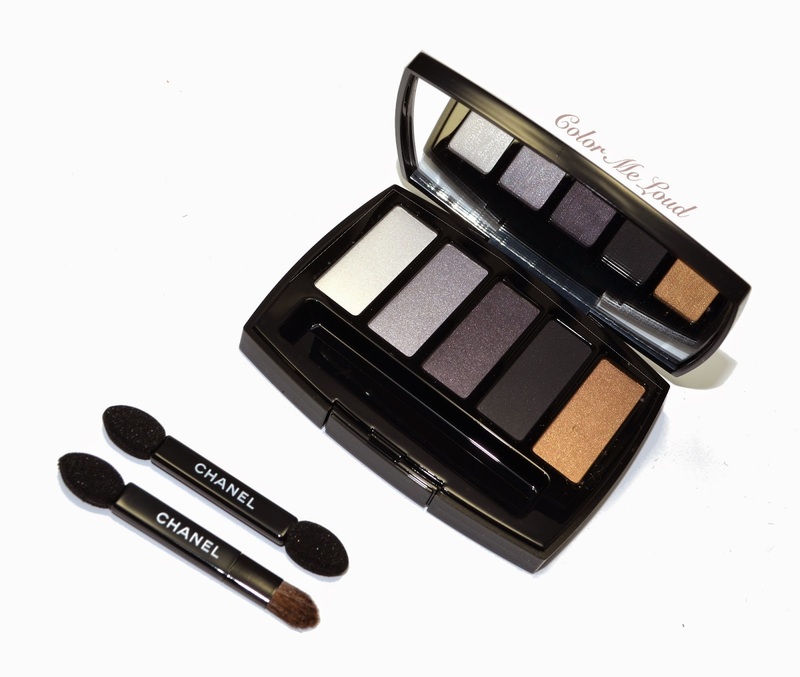 Do you have something in your wish list from Chanel Plumes Précieuses Holiday 2014 Collection? Oh Sara! As much as I like the look you've created, this one I will pass. I have last year's charming and the colors work so well for me. Oiseaux de nuits with that wite and especially silver wouldn't work for me, I simply wouldn't use them. Still all the colors together do look great! I love Charming! It is not another brown palette, for me the undertones work so great. This one is not that pretty, you are right. Hey Sara, I love how you paired this with Fashion Revival! It looks fantastic on you! I am not sure I can rock such a cool-toned palette. I might want to see it in person first. Hi Sunny, I think that golden shade will make it work on you. It did on me, although I am not fan of silvers neither. Wish the gold wouldn't be so sheer. You are right, there are much better smoky palettes out there. Shade no. 5 reminds me of Marc Jacobs the Dreamer mustardy colour, but so uncoherent with this palette. I'm still looking for some good greys so it's either this one or Burberry 01 smokey greys. I was so disappointed in this palette! Just swatched it yesterday along with the rest of the collection, and it was drier and felt cheaper than the previous Charming palette. Such a shame b/c I love Charming. Really liked the Illusion D'Ombre tho...was it me or is it more sparkly than normal? Love that lipstick on you, its stunning! Hi, I'm Urbis from Spektra forum ... Do you know if Reve d'Orient eye palette will be available in Europe? thanks for your lovely comment. Unfortunately it seems we are not getting that palette. At least for the time being. I will check out with a very knowledgable SA on the weekend and if he says we do, I will let you know. A friend got it for me from US so I will present it here soon. I haven't tried the peachy lipstick yet but it is on its way to me so I may write about it soon. I have seen a swatch in You Tube though, blogger was saying that it is very sheer. I have the blush, in fact wearing it in this photo. I am not move with it. It is very light as well so on my now tanned skin, shows up hardly. I saw this palette at the Chanel counter this past weekend and decided to skip it. It just... didn't do anything for me at all. Too cool-toned I think. And that type of gray doesn't go well with my skin tone. You made the final look come alive with Fashion Revival, though! Thanks once again as always for a swift review and helpful swatches! You are right, that silver is hard to pull off and the darkest shades are not that good. If I would have swatched it, I'd skipped too. Highlighter is gorgeous. I think it is the best piece of the collection and is a must have. I am going to post about it very soon. I feel what you mean about this palette. Love it!!! Love the colors here especially that they have put a gold one. It looks so great on you. I wanna try this too. Sara, the bright Fashion Revival looks really beautiful on you! Makes your beautiful face even more so. :) Please wear more brights! I envy that you can wear these cool grays! (like you did with TF$ Ice Queen). They contrast really oddly with my skin and don't look presentable. Aww Belly, this is so kind of you to say that. It seems I should be going more more on my lipstick choices but then I become a clown at work since I can't go easy on eyes. First world problems lol. Ditto about what you say. I actually like drier textures for deeper shades because they don't fall out but then these two look so close, why both at the same palette, huh? Have you caught Reve D'Orient? It looks stunning! Hi Sara, i love bright lips on you!!! Pls pls wear them more often! This palette is kinda hum-ha for me.... i'm just not taken by it at all (or is it only because it lacks the patterns to make it visually more exciting?)..... And I don't understand why they released such an uncoordinated collection!